Edgar, Dunn & Company (EDC), strategy consultancy specialised in payments, has designed this infographic based on interactions with key actors in the IoT space. 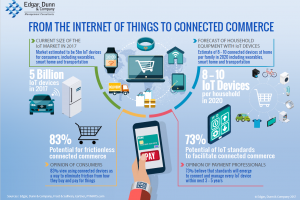 Recent commercial roll outs of connected devices with payment capabilities highlight the significance of payments in the Internet of Things space. This is the advent of connected commerce where frictionless purchases and payments become a reality.